Want to kick your organization into overdrive? Sandia Science & Technology Park and its tenants have capitalized on their neighborly relationship with Sandia National Laboratories. s the United States government enters the fraught territory of company ownership and "industrial policy," it might do well to consider its own infrastructure of national facility complexes as a growth engine too. National laboratories, NASA research centers, military bases and health centers pack their own brand of economic impact. The research and science parks in proximity to those complexes are prime spots for corporations to do their part. On the 10th anniversary of its inception, Sandia Science & Technology Park (SS&TP) was recognized by the Association of University Research Parks as its Outstanding Research Park of the Year for 2008. It was the first time the AURP had so honored a park that was not affiliated with a university. But its affiliations with Kirtland Air Force Base and with neighboring Sandia National Laboratories carried plenty of weight. "When we started 10 years ago, Sandia knew nothing about how to start a research park," says Jackie Kerby Moore, the park's executive director and a career Sandia National Labs employee. In an interview conducted at the annual global conference of the International Association of Science Parks (IASP), she says coming to such gatherings helped her see that a park established with a world-class, intellectual property-generating R&D institution such as Sandia could follow the university model. It didn't hurt that Sandia already had over 100 industry partners across the nation. She also learned that other parks at national labs were at various stages of development, including parks near NASA Ames in California, Oak Ridge, Tenn., Richland, Wash., and Los Alamos in her own state. he U.S. Dept. of Energy's Office of Science provides more than 40 percent of total funding for basic research in the physical sciences, and saw its budget boosted by $1.6 billion as a result of the American Recovery and Reinvestment Act. It is the steward of 10 national laboratories. Five are multi-program facilities: Argonne National Laboratory (Argonne, Ill.), Brookhaven National Laboratory (Upton, N.Y.), Lawrence Berkeley National Laboratory (Berkeley, Calif.), Oak Ridge National Laboratory (Oak Ridge, Tenn.), and Pacific Northwest National Laboratory (Richland, Wash.). The other five are single-program national laboratories: Ames Laboratory (Ames, Iowa); Fermi National Accelerator Laboratory (Batavia, Ill.), Thomas Jefferson National Accelerator Facility (Newport News, Va.), Princeton Plasma Physics Laboratory (Princeton, N.J.), and SLAC National Accelerator Laboratory (Menlo Park, Calif.). Work conducted at such federally sponsored installations as NASA Glenn Research Center in Ohio can have a reverberating economic impact across local, state and even national economies. The Office of Science also funds R&D conducted at national labs overseen by other DOE offices: Idaho National Laboratory; Lawrence Livermore National Laboratory (Berkeley, Calif.); Los Alamos and Sandia in New Mexico; National Energy Technology Laboratory (Morgantown, W. Va.; Pittsburgh, Pa.; Houston, Texas; Albany, Ore.; and Fairbanks, Alaska); National Renewable Energy Laboratory (Golden, Colo.); and Savannah River National Laboratory in South Carolina. Early June saw some of that Recovery Act money being put to work at Oak Ridge, as officials from the DOE and UT-Battelle broke ground on a $95-million, 160,000-sq.-ft. (14,864-sq.-m.) Chemical and Materials Sciences facility that will now be completed in 2011, nearly a year ahead of the original schedule. The new facility will provide space for up to 300 laboratory researchers and staff, and replaces lab and office space constructed in the early 1950s that is plagued with high energy and maintenance costs. "We are giving the scientists and researchers at these facilities the tools to develop a clean energy economy that creates jobs and helps combat climate change," said Energy Secretary Steven Chu. Also acting as science and R&D engines are many of the nation's current and former military bases, as well as its network of facilities affiliated with such science and technology-affiliated agencies as NASA, NOAA, USDA, EPA and DOE. NASA's John H. Glenn Research Center in the Cleveland community of Brook Park, Ohio, one of 10 NASA centers, has a 2010 budget estimate of $639 million, its highest in years. An economic impact report on the center (including its 6,400-acre [2,590-hectare] Plum Brook Station near Sandusky) published by Cleveland State University in September 2008 showed a total output impact across Northeast Ohio of more than $1 billion in FY2007. The total employment impact of Glenn Research Center on the Northeast Ohio economy in FY 2007 was 6,407 jobs, with associated household earnings of more than $333 million. companies and more than 2,100 employees on its premises, earning an average salary of more than US$70,000. The first company to arrive, EMCORE, was hatched from the national lab across the street. Two entrepreneurs left Sandia, then saw their company acquired by a firm in New Jersey, which eventually chose to establish a major division and then its entire corporate headquarters at SS&TP. Today its payroll numbers some 500, engaged in the development of photovoltaic products for satellites and telecommunications applications. A new application about to make its debut may have national implications in the quest to grow a smart electrical grid. "EMCORE is developing and deploying Concentrator Photovoltaics (CPV) systems for primarily grid-tied utility applications," writes Hong Hou, one of those Sandia scientists, now EMCORE's president and CEO, in an e-mail. "We have built and connected 175-kW CPV systems to our buildings through PNM's (Public Service Company of New Mexico) commercial distributed generation (DG) program. We are planning to expand our DG project to 2 megawatts using the land we leased from the State Land Office. The land, which was the land fill site, is in close proximity to our facility. 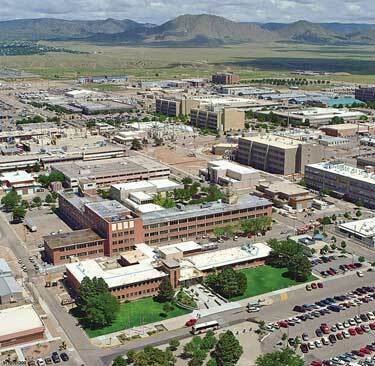 Hou says the proximity and accessibility to Sandia National Labs distinguishes SS&TP from a business park. The company owes more than half its current revenue to successful technology transfers and commercializations. "We have been working with the Lab very closely to commercialize new technologies and to get assistance for new product development and validation," he says. "We will continue to mine the technologies developed at Sandia for future possibility of commercialization. In addition, we are working closely with other tenants of the park as we have developed more critical mass and a technology cluster." "We've worked hard to create a business community, and we track the amount of business," says Kerby Moore of the cluster. Many of the companies have government contracts, with a number associated with space applications. Kerby Moore says one significant difference between a park like hers and a standard industrial park is having a full-time staff that supports tenant companies in business development. "If you buy land and move into a non-research park environment, once you close the deal, everyone goes away," she says. Applied Technology Associates started out in 1975 as a provider of R&D services and support to the airborne laser lab. The company has since expanded its capabilities into data acquisition and data analysis systems, hardware and software systems development and advanced optical systems, including applications for spacecraft. The company's products are all about precision sensing, motion and control. The company has grown by 25 percent annually for the past two years, and also maintains facilities on Kirtland AFB and White Sands Missile Range in New Mexico. Today it is poised to expand its facilities at SS&TP. "Since we moved in, a line of hardware products has expanded, so we really needed to expand our manufacturing facility," says Anthony Tenorio, ATA's president and CEO. "it turns out our products made it into space. Our building was really designed for people. So we needed to retrofit our building." The manufacturing expansion will add 24,000 sq. ft. (2,230 sq. m.) to the existing 16,000-sq.-ft. (1,486-sq.-m.) building. Tenorio says the goal is to start construction in early July and finish by May 2010. About 30 percent of the new space will be a high-bay area to accommodate spacecraft integration testing. t the annual global conference of the International Association of Science Parks in Raleigh, N.C., in June 2009, Andrew Witty, CEO of U.K.-based GlaxoSmithKline, took note of Research Triangle Park's 50th anniversary by remembering his own experience just 20 years ago. "When I first moved here in 1987, we had a house in north Raleigh in a new subdivision, and I felt a bit like I was almost in Virginia, it was so far away from downtown Raleigh," he says. "Now it feels like it's downtown. It's worth reflecting on what it would have been like in North Carolina if RTP hadn't been created. It's tough to answer whether or not there would have been a vibrant North Carolina." 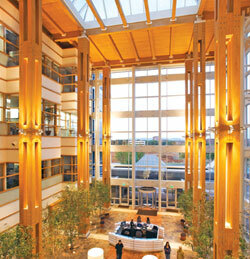 Proof of such vibrancy is constantly in the offing at RTP, where GSK now occupies 3 million sq. ft. (278,700 sq. m.) on 690 acres (279 hectares). In May, Bayer CropScience said it would expand its Morrisville facility, creating 128 jobs with an average salary of more than $100,000. Witty's prescription for vibrancy highlighted examples in Qu�bec and Singapore too. Crucial to all such successes, he said, was a sense of shared values. "At the very bedrock of a successful collaboration there has to be a meeting of minds as to a sense of mission, which goes well beyond the checkbook," he said. "Innovation research is a lifetime commitment. Our investment [in RTP] dates back to the 1970s. We built those facilities knowing nothing would come out of them for at least a decade." Witty was clear about what companies such as GSK expect to encounter when looking for places to grow. "I'm going to invest in high-tech research jobs in countries and states which support intellectual property," he said. "I'm not going to invest in places that don't support IP. That's critical, and there's no point in pretending otherwise." Next on the list: talent, and the incentives for allowing that talent to move among different sectors. "If it's socially frowned on for academics to 'go native' into industry, that's not going to be good," he said. "That's an area where there is still an enormous amount of work to be done. In Europe, there is still significant academic snobbery – many governments are wrestling with it. It's not good enough just to have the academic institutions. You have to have that porous relationship, and exchange of skills." The next item on Witty's checklist is a pro-innovation environment, aka a non-protectionist environment. "If you're looking for a high-tech business to invest in your park, and your government is running a 'buy local' procurement program or 'buy cheapest' initiative, that's not creating a pro-innovation marketplace. I'm afraid there are very many policy makers in the world who do not believe that the market dynamic influences investment decisions." Witty decried the speculative real estate-driven model that often drives science park projects: "Build the software more than the hardware," he said. "It's the software where the value really sits." He also lauded the "plug-and-play" approach of places like Singapore when it comes to economic development facilitation for foreign investors. And he closed with ruminations on where the next innovations may arise, as the age of research driven by big companies seems to be on the wane. "I think it's an open question whether or not, at a very fundamental level, in our industry and others, we are in the period between seams in the gold mine," he said, describing the depths to which gold miners dig to develop a seam no thicker than one's little finger. "I think innovation is not dissimilar to that," he said. "There are periods where events and knowledge coalesce to create a great seam of productivity. Pharma lived through that from the 1970s through the early 1990s. But these seams don't last forever, without the reinvestment to find the next seam. "The big winners of the next generation will be the science parks who were able to create the circumstances to attract the companies who will be the integrators of the next generation of technologies," he told his international audience. "We're very focused on it as a company. We're thinking about whether we should get into your business a bit. How can we accelerate the potential integration of all of these technologies, and break down the walls to our own research facilities? Inside those, we've already broken them down into small biotech businesses. The next step is to break down the walls completely, with co-located start-up companies right next to GSK facilities. That is the set of discussions we've initiated with our major facilities." Indeed, such talks had occurred with RTP officials within two weeks of Witty's speech, confirmed Rick Weddle, president and CEO of the Research Triangle Foundation of North Carolina. "Now is the time in our sector to start to think about how we find the next rich seam of discovery," said Witty. "The challenge to you is how to figure out where the next rich seam is going to be." very nation has its own challenges and solutions in developing an infrastructure for innovation. 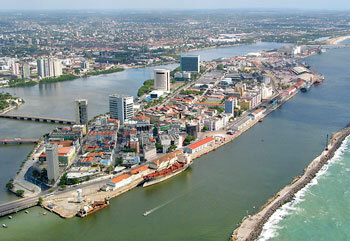 Porto Digital (pictured) is an Information and Communication Technology Cluster project located in Recife, the capital city of the State of Pernambuco, for years one of the poorest areas of Brazil. Launched in 2000, the project currently comprises 107 institutions. It has been a catalyst for redevelopment of the harbor and for talent retention. "In 1989, when an entire group of students graduated, 100 percent of them went to jobs at one company in Sao Paulo," explained Fabio Silva, a professor at the Center of Informatics of the Federal University of Pernambuco and a co-founder of Porto Digital, in a presentation at the IASP annual conference in Raleigh, N.C., in June. "The professors said if we don't do anything about it, there will be nothing left in 20 years." smaller building on the other side of Albuquerque. "Prior to that, we had tried getting into the door of Sandia," says Tenorio. "We tried many times to break in, and we had not been able to. One of the commitments [SS&TP Program Director] Jim Clinch and Jackie have given us is a lot of exposure. That was a deciding factor. We've always had a good portfolio of products that we knew fit into what they do, and the movement just gave us great visibility. "Also, the location is right at the entrance to the base," he says. "Right in this area, there are companies we've established relationships with. We do business with several of them now, because we're co-located." Kerby Moore says the park's prospect list is currently filled with energy and defense companies. "Interestingly enough, we're getting a lot of inquiries, more than normal," she says. That's good, given the competition. "At Sandia National Labs, the annual budget is $2.4 billion – that's how much the Chinese government has invested in the Hong Kong Science Park," she says. "We employ 10,000 people, and to think that a government would invest that same amount of money in a research park was astounding." Kerby Moore says the park has a lot of partners who are interdependent and have worked together well through leadership changes. But she says if she were starting over now, one thing she'd change is to make the park's memorandum of understanding more formal and binding. That said, however, she and the park's companies are looking ahead, not behind. "In addition to running our park, I run our entrepreneurship program," she says. "Since its inception, we've had 136 Sandians leave to help start companies. The program allows them to leave Sandia on entrepreneurial separation, start a company, and Sandia will promise them their job back after two years." Such a program might seem contrary to the conservative mindset that usually reigns at a national lab that performs weapons work and has a national security mission. But Kerby Moore says her team has worked hard to create an entrepreneurial culture. "One hundred and thirty six have left with the understanding they could come back, and most of them have stayed out," she says. here may be no better place to illustrate the coveted "triple helix" of corporate, academic and government partnership and innovation than Huntsville, Ala.
"A lot of people in the U.S. don't know how important Huntsville is," said Ross C. DeVol, director, regional economies for the Milken Institute, as he informed attendees of the IASP's annual conference of the city's No. 5 rank nationally in scientific and creative services, part of Milken's new analysis of community science and technology prowess. Contributing to Huntsville's unique milieu is the new HudsonAlpha Institute for Biotechnology (pictured), a 270,000-sq.-ft. (25,083-sq.-m.) facility in Cummings Research Park's specially zoned, 150-acre (61-hectare) CRP Biotech Campus that was funded by $80 million in private money and $50 million from the State of Alabama. The Institute is designed to accommodate 700 people and features a full range of technology and functions, from a genome sequencing center to a vivarium to a BSL-3 lab. By the time of the formal grand opening in April 2008, expansion plans were already in the works. Mark Jensen, principal, science and technology, at architectural firm Cooper Carry, says the design was redirected by co-founder Jim Hudson to focus more on people than technology. "We were at an executive committee meeting, going through the minutiae, when Jim Hudson said, 'Timeout. Stop,' " said Jensen during his own presentation at IASP. " 'What I want to know is how you're going to take these distinctly different cultures and bring them together. I want you to design a building that's completely backwards. If you go to big pharma, the CEO is up high and looking out. It's the same with a research institute. Turn it backwards and have all these egos together in one space and have them look at each other.' "
Thus, on a typical floor at HudsonAlpha, the CEO offices for such tenants as AGI and Open BioSystems (just acquired by ThermoFisher Scientific) face an atrium that is also looked upon by the primary research investigators positioned in labs on the other side. "When we made the transition from being in the weeds to pulling back and looking at the people issues, that's when this project got really creative," said Jensen, noting the popularity of the Institute's "hangout" spaces. CRP is second only to Research Triangle Park in size (3,843 acres, or 1,555 hectares) and seniority (45 years) among U.S. research parks. It boasts more than 220 companies active in more than 40 separate technology fields, including 20 FORTUNE 500 firms.